↑ Ask Abe Archives – Campus Traditions. Uwalumni.com. یوْخلانیلیبMarch 11, 2012. ↑ ۴٫۰ ۴٫۱ ۴٫۲ Facts. 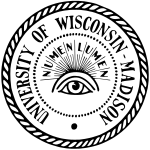 University of Wisconsin–Madison. یوْخلانیلیبDecember 19, 2016. ↑ Colors for Web. University of Wisconsin-Madison. یوْخلانیلیبMarch 18, 2017. بۇ صفحه‌‌ سوْن دفعه ‏۲۳ فوریه ۲۰۱۸، ‏۰۶:۱۲ تاریخینده دَییشدیریلمیشدیر.